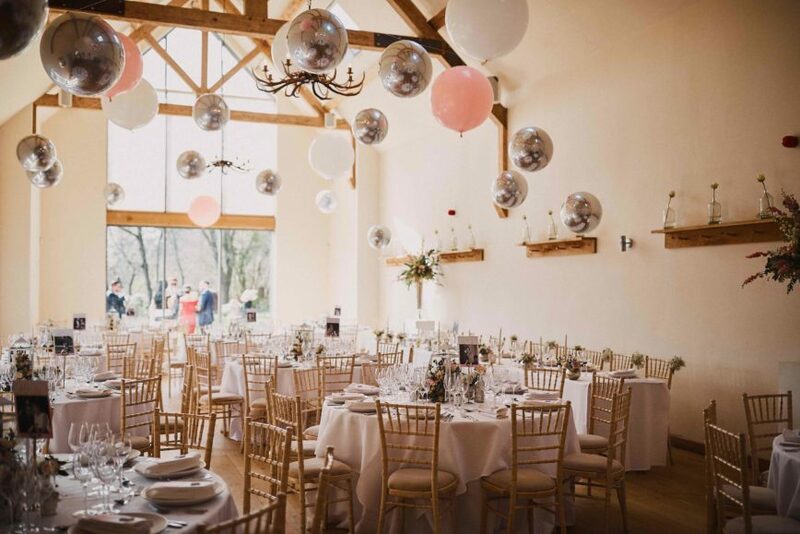 Here at Millbridge Court, our Dining Barn features high vaulted ceilings with rustic beams, a floor-to-ceiling glass wall, wooden floors & soft white walls; the end result of which is a light, airy, neutral space, which allows for each & every celebration to look truly unique & reflect the style of the couple. With there being so many possibilities available to Millbridge Court couples, we are always so in awe of the varying ways in which the Barn is transformed throughout the seasons by the wonderful industry professionals who are entrusted to bring these visions to life. The neutral canvas ensures that every styling detail stands out, so whether there are low or high centrepieces, giant balloons suspended from the beams, coloured linens, round tables or banquet tables, no detail goes unnoticed. In this blog post, we are sharing images from a handful of our 2018 Wedding Days, showing an array of setups, styles & floral arrangements in the hope that it provides all of you lovely readers with some Millbridge Court Wedding Day Inspiration.